The Pilates Tower is next most popular Pilates machine after the Reformer. Where Mat Pilates is more difficult to do if you are not already conditioned to be aware of your form and the muscles you’re using, apparatus like the tower helps you find your muscles with body conditioning assistance. The tower also comes with various attachments that use resistance springs to help you tone those muscles as well. 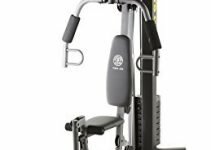 Our Pilates toning tower reviews focus on two specific models that are designed for home use and we’ll compare them to help you decide which one to buy – the Supreme Pilates Pro Vs Supreme Toning Tower. Both the Supreme Pilates Pro SPP089 and the Supreme Toning Tower are made by the same company, Beverly Hills Fitness. The former is a more advanced and expensive model, so we’ll cover the differences in the two as well as the pros and cons of both. You can do around 100 exercises with either of them. Mat Pilates is great to do at home. You don’t need expensive equipment and all you need is space for a yoga mat. However, many beginner practitioners and those who are less fit find it difficult to maintain proper form or be able to target specific muscles without the aid of anything. You have to be fully aware of your movements, your spine and which of your muscles are being targeted with each exercise. That’s where a machine like a tower or reformer can help. 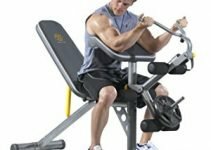 Springs: Using resistance springs can help you with certain exercises. When doing partial sit ups and rollups they aid you when you hold onto a spring loaded top bar during the pullup. If you normally find it difficult to get enough lift, they aid you there as well. At the same time, springs can also make you work harder with some exercises if you work against their pull. Because you’re adding resistance to your workouts, your muscles have to work harder and you will quickly feel which muscles are being targeted. Your core strengthens faster too. Stretch: You can get extra stretch and release of tension with tower Pilates by bracing yourself against the tower stands or a bottom-loaded bar while working against the pull and then releasing. If you work all day at a desk or have been out dancing all night, try a round of Pilates tower exercises to stretch the muscles and spine out to relieve tension and instantly feel taller and more relaxed. If you have back or spine problems, you can add a spine corrector to your tower workouts to help with that. Isolation: A tower is great at making you focus on one set of muscles at a time, whether they’re in your arms, your core or your legs. For those looking to sculpt a particular part of your body, there’s no better way. The Tower is really a derivation of another apparatus invented by Joseph Pilates – the Cadillac or Trapeze Table. It is a great machine but way too bulky, and even most Pilates studios couldn’t afford to buy it or reserve so much space for it. That’s how the Pilates tower equipment was created. 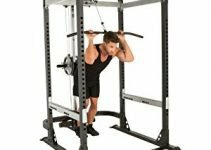 A tower will let you do everything you do on a Cadillac but take up much less space and you can even get an affordable one for your home gym. Stability: The Reformer is based on using your body to move the carriage, while on the Tower, only you move with the help of attachments while the platform is stationary. For those who prefer the feeling of a stable base, the Tower is the one to choose. Flexibility in Exercise Routine: Most Reformer workouts follow a standard set of exercises to be done one after the other. Beginners can find this intimidating. With a Tower you have more flexibility and can do more repetitions of certain exercises that you feel you need more. The learning curve for these exercises is also lower and mastering beginner exercises is fast, so you have more motivation to keep at it in order to move to the next level. You can always go back to the basics as well to add variability. If you’re looking for more intense body and muscle building workouts using resistance springs or bands, you should take a look at a suspension training system. It uses your body weight along with resistance bands for a more intense workout and you can take the system anywhere with you as long as you have a suspension hook, post or tree branch to anchor it from. The Supreme Toning Tower is the lighter and more affordable option. The frame is made of high grade stainless steel, while the Barre bar is made of natural-feel wood. The base Yoga pad is made of a high density and sweat resistance material for comfort and durability. The tower with Barre can be folded down onto the base when not in use to just 4″ in height. The base is set on luggage-type wheels, so you can roll it under a bed for storage. The smooth moving Pilates Swing-through Bar gives you a proper ab and core workout. There are 2 foot and hand straps attached to medium tension free-flowing resistance coils that are attached to the Barre to work your arms or legs alternately or at the same time to either do slow movements for strengthening and toning or quick movements for no-impact cardio. The Sculpting Bar slides through the hand straps for added core and upper body workouts and posture enhancements. You get two workout DVDs, one for the Toning Tower and one for the Barre. The unit comes fully assembled and you just have to put on the wheels if you want to roll it away. It weighs 35 lbs and measures 41″ high when extended with a footprint of 48” x 25″. This unit’s maximum capacity is 250 lbs. The Supreme Pilates Pro SPP089 is more expensive but also more advanced. The frame is of high grade steel, while other components are made of wood. The base is made of two high density sweat-resisant lumbar pads. The Barre bar is made of wood and can be adjusted to three positions for height via the tower’s telescopic poles. To fold for storage, the Barre can be pushed down to its lowest height and the base folds into two. Then the tower folds down over the base with a height of 8″. The provided locking strap keeps all parts secure. The wheels allow you to roll this very compact package into a corner or under a bed. The Swing Thru bar for upper body workouts is made of wood. There are 2 sets of resistance coils. One set is shorter than the other to provide you with two different levels of resistance. The longer one provides lighter resistance and the shorter one provides higher. A pair of hand and foot straps attach to them and a wooden Sculpting Bar with them. A low steel bar for your feet allows you to bracing yourself for certain stretch and release exercises. You also get and ab and body ball for doing more workouts on the Barre. There’s also an air pump for the ball. To help you get started and continue for a good variety of workouts, you get 5 DVDs. Titles include “8 Basic Pilates Moves”, “Supreme Ab Blast”, “Lower Body Burn”, “Speed Sculpting”, and “Barre Workout”. No assembly is required and you just have to attach the wheels if you want to roll the unit away for storage. The base measures 5 ft by 2 ft and the tower is 4 ft tall when expanded. It weighs 52 lbs. This unit is warrantied for users up to 300 lbs. Both these models are designed for home use and combine Pilates attachments with the Barre in one piece of equipment. You can perform a variety of exercises on both to give you a sculpted, longer, leaner and healthy body. They differ in a few ways. The Supreme Pilates Pro is a more expensive and advanced model with more versatility for workouts. If your budget is smaller, the Supreme Toning Tower will do nicely even with the few set of features. It is lighter, more easily moved and has fewer moving parts, although it’s weight limit is a bit lower than the Pilates Pro’s. The Tower on the Pilates Pro is adjustable for height, depending on whether you want to do a Pilates workout or a ballet Barre workout and you can set it to be just right for your height. It also has a fixed low foot brace bar for comfortable stretch and release exercises. The Tower on the Toning Tower is set at an internationally recognizable height of 42″ for Barre. Since there’s no horizontal brace bar, you have to plant your feet on the poles if you want to brace yourself. The Toning Tower folds just once into a lower but longer package. It will fit under low beds but will still need enough floor space for its footprint. The Pilates Pro folds into a smaller footprint if you want to store it in a corner or closet but you won’t be able to store it under a low bed frame. It is amazing how inexpensive this model is and is a good backup to your studio classes or if you just want simple regular Pilates workouts at home. Because the Barre is of fixed height, it not recommended for those over 6 ft tall. If you are, then get the Supreme Pilates Pro that has an adjustable Barre. There are two sets of hooks for your springs to attach, so it’s easy and quick to change their attachment points between workout sets. If you don’t have floor space to keep it open after you’re done, it’s easy enough to store away because folding and rolling it around is simple. Although this model is double the price of the above model, if you’re using this so that you can replace or reduce your studio classes, it is well worth the cost. You will make it up with the amount you save on those classes. Keep in mind that a commercial reformer and tower in one can cost upwards of $4000! Because the Barre is height adjustable, if you want to hook your springs lower or higher you have to adjust the Barre each time, which is inconvenient if you want to move smoothly from one exercise to the next. The best thing to do is to find one ideal height for the most number of exercises and stick to that before changing. Although most users say that this unit is sturdy, a couple of heavier customers say it is not and the platform creaks when you stand on it. However, even very tall people can use this, as the Barre height is adjustable. It is not the easiest thing to fold away so you’re better off finding a permanent place to keep it open all the time. If the DVD workouts that come with this equipment are too basic for you, just go to YouTube and look for Ellen Croft’s Tower exercises like the video below or the ones provided specifically for the Pilates Pro and Toning Tower.